To know Drew Ray Tanner is to love him. I was in the studio positioned behind a set of thick, dark curtains that slice the room in half when he walked in. I could not see him, yet somehow I could sense his energy as soon as he entered the room. With his lively personality, he doesn’t hesitate to make friends and he quickly won over everyone on set. What stood out the most about Drew is that in the midst of his booming voice telling stories or sharing his day on social media, he was swift to learn everyone’s name and include them while he spoke. His energy doesn’t overshadow his awareness of those around him. From 2011 to present, Drew has played characters in a considerable amount of movies and television series. Like many, his love of acting was born as a child and his investment in the arts played a big role in his life growing up. One of his most recent roles is in the hit drama-mystery television series, Riverdale, where he plays Fangs Fogarty. 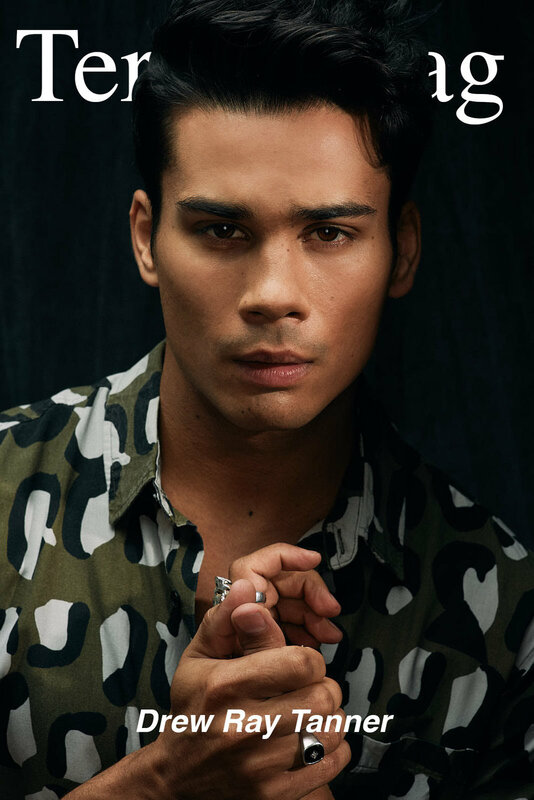 In our interview Drew shared with me what is was like for him to get into acting, the lessons he has learned along the way and insider information about playing Fangs. Once Drew got a taste for being on stage, he never wanted to stop. “I was in every school play after that. I played Rudolph the Red-Nosed Reindeer, another time I played Santa Claus. Come to think of it, I think I was the first biracial Santa in town!” Clearly having moved up the character ladder as achild, it’s easy to see that Drew was just as ambitious then as he is now. At eleven years old Drew started to conjure up ideas of moving from stage to television. Growing up, Drew was just as involved in playing football as he was in theatre and he soon caught wind of a Coca-Cola commercial casting young football players. “I thought it would be so much fun. I could gel these two worlds together, if only it was possible,” he said as he looked off into the distance dreamily, then laughing. Unfortunately, Drew’s family didn’t have the time or the resources to support a child auditioning all the way out in Vancouver. This didn’t bother Drew as he continued to give his all in football, but that desire to audition stayed with him and reignited in his late teen years. It is clear that Drew was in love; when you know, you know. Following his last high school production he promptly declined his scholarship offers and settled in at home to make a plan for his future; one that would involve full time acting. He described the situation as a “running off to the circus” moment. Having done my own thorough investigation on Drew before our chat (it’s not creeping if it’s for work), I noticed that he was listed as a cast member of the 2017 remake of Power Rangers. I had to know what the experience was like for him on such a big budget movie. When I brought it up not knowing what part he played in it, he gave a little laugh and said, “Oh yes, I was “Young Lover #2” on Power Rangers.” What I was surprised to learn is that this experience not only gave Drew incredibly fun memories, but it taught him a very valuable career lesson. Drews journey into Riverdale dates back to the beginning stages in 2015. Initially, they had him read for Jughead and then later for Reggie. Not knowing quite what direction they were wanting to go with the show, all Drew could do was give his take on the characters and try his best. As we know, he didn’t book either role, but due to his lack of knowledge of the show the rejection didn’t phase him. Season three of Riverdale is fast approaching its release date of October 10th of this year, and it seems to be one fans will love. “We’re ramping up for an exhilarating season of Riverdale this fall! Recently we all watched the first episode together and it was phenomenal. We were all so pumped to see it, there is so much in this season that the fans have to look forward to and that I’m extremely proud of. It’s so good,” he tells me enthusiastically. Feeling as though Fangs could truly be himself in that environment opened up a whole new side to the character Drew has been playing over the last year. He shared with me that this is the progression that Fangs will take in season three as well. As the Serpents have lost their homes and are now living in what they call “tent city”, Drew got to explore Fangs and his reaction to being in this environment. The fans can expect to see how the stakes are raised and just how far Fangs will go to protect the ones he loves. “I think you’re going to see him willing to do whatever is needed for the greater good,” Drew tells me, leaving an air of mystery as to exactly what that means. Drew is a firm believer in never forgetting the reason that got you into the audition room in the first place or the spark in you that caught their eye. Even when times are tough and bookings are few and far between, continuing to work on your craft and staying grateful will take you so far. To see more of Drew’s projects and life-happenings, follow him on instagram @Drewraytanner and don’t forget to watch him as Fangs Fogarty in Riverdale’s third season, coming to Netflix on October 10th.